In 1960, the city of Detroit was the greatest manufacturing city that the world had ever seen. Nearly two million people lived there, and it had the highest per capita income in the United States. That may be hard to believe, because today it actually has one of the lowest per capita incomes of all of our major cities. Over the decades more than a million people have left the city, and thousands of abandoned homes have been torn down. But there are still tens of thousands of abandoned dwellings that remain standing, and some have sold for as little as one dollar in recent years. 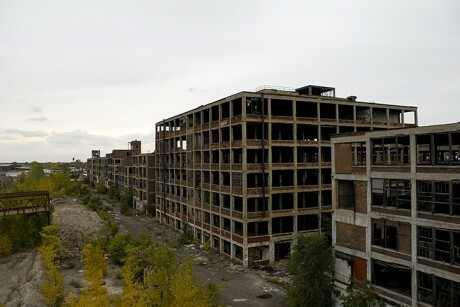 Once Detroit was the envy of the entire planet, but now it has become a global joke and in other countries they love to do news stories about “the ruins of Detroit” to show how rapidly America is rotting and decaying. Sadly, Detroit is far from alone, because there are other formerly great manufacturing cities that have declined just as fast as Detroit has. It has become known as a mecca of violent crime and poverty, and now a viral video is giving an unpleasant view of Detroit after dark. The clip, called Driving through Detroit at night, was filmed by a woman who was a passenger in a car going around the Motor City and was posted to Twitter at the weekend. It shows terrifying scenes of gangs gathered on the sidewalk, prostitutes lifting up their skirts and dancing, and even a man being run over by a car on purpose. I would have liked to share the video with you all, but it is just way too graphic. There really are prostitutes lifting up their skirts in the video, and a man really is hit by a vehicle. If you want to watch it for yourself, it is very easy to find on YouTube. But please be warned that children should not be watching this. If you live in a peaceful rural or suburban setting, the kind of behavior displayed in this video may seem very foreign to you. In America today, it is way too easy to allow our televisions to define reality for us. But the warped view of reality that we get through our televisions is nothing like the real world. The real world is cold, cruel and very unforgiving. If you are in the wrong place at the wrong time, the real world will eat you alive. In the city of Detroit today, close to half the population is functionally illiterate, and one survey found that 60 percent of all children in the city are living in poverty. It has been reported that 40 percent of the street lights do not work, and as you can see from the video it is a very frightening place to be after dark. And don’t count on the police to help you. The size of the police force in Detroit has been reduced by about 40 percent over the years, and it has been estimated that it takes the Detroit police an average of 58 minutes to respond to a call. If it was just one major city where all of these things were happening, that would be bad enough. The listing places St Louis above the notoriously dangerous Detroit which has topped the list in previous years thanks to the city’s high gun crime rate. Detroit is now listed as third after Memphis, Tennessee which had 84.2 violent crimes per 10,000 residents. Birmingham, Alabama comes in fourth place with 82.8 violent crimes per 10,000 residents while Rockford, Illinois was fifth with a rate of 76.3. Earlier this month, we saw how a major city such as Milwaukee can erupt in flames in just a matter of hours. And in Chicago, some of the major gangs have agreed to use automatic weapons and sniper fire in their battle against the police. A spirit of chaos and violence has descended on America, and things are going to get much worse during the months and years to come. The call log on the store stretches 126 pages, documenting more than 5,000 trips over the past five years. Last year police were called to the store and three other Tulsa Walmarts just under 2,000 times. By comparison, they were called to the city’s four Target stores about 300 times. Most of the calls to the northeast Supercenter were for shoplifting, but there’s no shortage of more serious crimes, including five armed robberies so far this year, a murder suspect who killed himself with a gunshot to the head in the parking lot last year, and, in 2014, a group of men who got into a parking lot shootout that killed one and seriously injured two others. Police reports from dozens of stores suggest the number of petty crimes committed on Walmart properties nationwide this year will be in the hundreds of thousands. This Bloomberg report says that there will be “hundreds of thousands” of crimes just committed at Wal-Mart stores alone this year. If people are behaving like this while times are still relatively stable and relatively good, what would things look like during a real crisis? Many people openly wonder what happened to Detroit, but it really isn’t much of a mystery at all. Over the decades, our politicians have stood idly by as tens of thousands of businesses and millions of good paying jobs have left the country. Our economic infrastructure has been absolutely gutted, and as a result formerly great manufacturing cities have become rotting, decaying hellholes. And it certainly doesn’t help that voters in many of these cities have willingly chosen to put radical leftists into power time after time. Unfortunately, it appears that the nation as a whole is about to hand the keys to the White House to a radical leftist that has a violent temper that is absolutely legendary. If she gets into power, that might just be the final nail in our coffin. What has already happened to Detroit is slowly happening to the entire country, but we never seem to learn from our past mistakes. So now we will suffer the consequences for our very foolish decisions, and it will not be pretty. August 22, 2016 in Uncategorized.